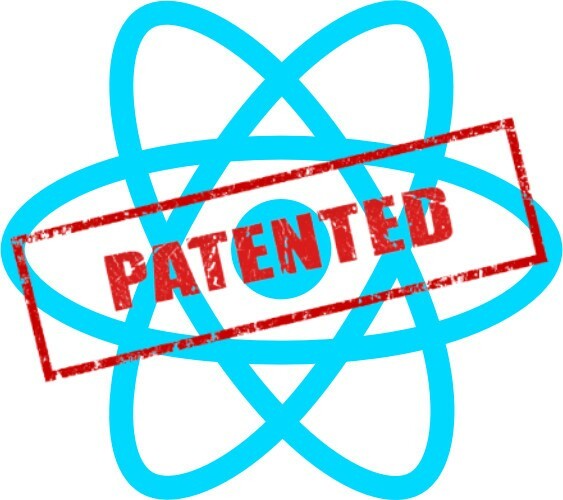 React, Facebook, and the Revocable Patent License. Why It’s a Paper 🐯. Update(9/25/17): My article about the licensing change. Update (9/22/17): Facebook will license React 16 under MIT. However, no word yet about patent grants for React. If Facebook fails to grant patents, then React falls into the same miserable rabbit hole as GraphQL. If React 16 fails to grant patents, this just got a whole lot worse. Update 2: React may not be an issue, but GraphQL is! The Internet (aka Hacker News) worked itself into another tizzy over Facebook’s React patent retaliation clause. Let’s run though a quick primer on patent law, React’s patent license, and the implications of the clause. By the end, I think you’ll agree that the clause amounts to a paper tiger. Patent law is an oft misunderstood and opaque wall of legal jargon. For a base understanding, let’s see if we can unpack it from 100,000 feet. Patents do not grant a right to make or develop. Rather, patents grant a right to exclude. For instance, suppose that Company X patents a pencil. A few years later, Company Y patents the eraser for a pencil. Company X’s patent excludes Company Y from making a pencil, never mind a pencil with the eraser. But Company Y’s patent stops Company X from making a pencil with an eraser. Company Y’s patent is known as a “blocking patent.” Company Y cannot make their claimed invention because of company X’s patent, but they block company X from the improvement. In light of blocking patents, open source software companies seek to limit their patent infringement exposure. Open source companies don’t want litigation for improvements to their underlying software — they want a free license to the eraser because they invented and gave away the pencil. That desire gave rise to patent retaliation clauses. Generally, there are two types of retaliation clauses — strong and weak. Weak clauses state that if a licensee asserts a patent claim against the licensor relating to the underlying software, the original patent license terminates. In terms of the pencil, Company X licenses an open source pencil with a weak retaliation clause. Company Y patents an eraser. Company X then makes a pencil with an eraser. Company Y sues X for infringing their eraser patent. Company Y then loses their patent license to the underlying pencil. Strong clauses go further than weak clauses. Specifically, any patent claim terminates the license, regardless if the claim touches on the underlying software. Company Y sues X for infringing their hot air balloon patent. Company Y loses their patent license to the pencil. The license granted hereunder will terminate, automatically and without notice,if you (or any of your subsidiaries, corporate affiliates or agents) initiatedirectly or indirectly, or take a direct financial interest in, any Patent Assertion: (i) against Facebook or any of its subsidiaries or corporateaffiliates, (ii) against any party if such Patent Assertion arises in whole orin part from any software, technology, product or service of Facebook or any ofits subsidiaries or corporate affiliates, or (iii) against any party relatingto the Software. Notwithstanding the foregoing, if Facebook or any of itssubsidiaries or corporate affiliates files a lawsuit alleging patentinfringement against you in the first instance, and you respond by filing apatent infringement counterclaim in that lawsuit against that party that isunrelated to the Software, the license granted hereunder will not terminateunder section (i) of this paragraph due to such counterclaim. The important part is what’s missing. There’s nothing that relates the patent assertion (any patent lawsuit) to the underlying software. That makes this a strong patent retaliation clause. The argument for hysteria goes something like this: “Facebook need not fear litigation and can now raid your patent pantry.” Whoa. Let’s step through that assertion with a heavy dose of reality. To analyze what happens when a React user sues Facebook and their React patent grants are revoked, we need consider liability and damages. I read Facebook’s patent retaliation clause to be restricted to the clause itself. That is, triggering the strong patent retaliation clause is limited to the patent grant itself. Thus, the BSD-3 license remains in effect. If that is true, there is no breach of contract of the underlying software license. It’s the same analysis as contractural damages. If someone has a specific case or persuasive argument that the patents clause also extinguishes the underlying license or copyright license, please make it. Patent liability and damages are two areas where laypeople are understandably confused. The first problem is liability. To assess liability (did someone infringe a patent? ), you must first determine the scope of the patent’s claims. I’ve seen many Internet message board tussles proclaiming a patent’s specification (“spec”) as legally protected. The spec is not protected. The spec is actually a mind dump — everything the inventor can conjure about the invention. The only legally actionable part of a patent is the patent’s claims. Claims are hard to read. If you say what an invention is, you’ve said what it isn’t, so they are intentionally vague. For instance, if the pencil patent claimed a “writing instrument composed of wood with a graphite end”, any pencil composed of something other than wood would not infringe. Instead, a better claim might be “a device for marking a surface comprised of: a gripping end coupled with a marking end.” Take a look at the claims for Apple’s slide to unlock patent as an example of the spec versus the claims and the general claim ambiguities. The above preamble is to say that it is very difficult to assess liability! Law firms are paid billions of dollars every year to answer that question and often get it wrong. Federal courts have special pre-trial hearings to decide claim interpretation. And appeals courts often overturn trial courts. To determine patent liability asserted by Facebook, we need to assess Facebook’s various patents and their claims. Or more specifically, which Facebook patents claim any underlying React technology? As the above illustrates, this is not a trivial question. But in my cursory search, and the crowd sourcing behind this Facebook clause, that answer is zero. (Again, if you have examples, send them over.) Moreover, it would suprise me given the USPTO and courts general disfavor of software patents if Facebook had anything patentable in React, much less actually patented. The prior art of componetization, diffing, and virtual doms circa 2013 is very well known, and I don’t see any applicable continuation patent applications. And even if Facebook could assert a valid patent protecting React, the damages are very speculative. I cannot find a case awarding a judgement for infringing a patent otherwise licensed through open source. And even if there is precedent, it’s still not a case that I’d want to file. “Hey Juror #3 on day 5 away from his/her work, please award my client, Facebook, money because we pulled a patent license that’s otherwise granted to millions of other people free of charge because we are very damaged by the infringement.” Yikes. Let’s play this out further. Say that your company patented the React stateless component — cheeky devils — and you want to sue Facebook. First, your patent claim is likely worth more than your entire company, so who cares about your underlying business and use of React? But second, you would likely spin that patent off to a holding company (did someone say troll?) and sidestep the issue altogether. Or you could fork React and engineer around the asserted patents. As a practical matter, what are we really discussing? React patents are not the functional equivalent to LTE patents. React is just one of many JS frameworks that will likely be obsolete before a patent suit could land in court. React to the licensee is, simply, functions that return (almost) HTML. Stripping React from your code base isn’t the hardest task. If I advised Facebook, I would admonish them that React licensing with patent revocation is not a vehicle to steal IP because stripping React from a code base is trivially easy compared to a legitimate patent dispute. For perspective, most IP firms requrie a $1–2M retainer to start a patent lawsuit. Therefore, a patent suit needs a high likelihood of success and recovery in the ~20M range. Could React be scrubbed from your codebase for those kind of numbers? Facebook wants to make open source software and not be sued — a noble goal. To that end, they can use some harsh and probably unwise clauses. But in this case, for the practical and legal reasons outlined above, it’s hard to find any teeth behind the bite. First, Cisco just paid billions of dollars for AppDynamics. Second, I could write a new blog on all of the things wrong with that hypo, but let me sidestep it and address the question practically. React is open source. If it’s too arduous to remove React, you can fork React and design around the patents. I guarantee that if there are any patents protecting React, those patents are so narrow that designing around the patent is trivially easy. To give some context, I prosecuted a patent through the USPTO for a “like” button on a DVR screen. Yes, seriously. But many engineers bonus through patents — however lame — and the Fortune 100 company didn’t care about my bill, so, fine, let’s patent a like button for a DVR. The USPTO examiner predictably and properly blew up my initial patent application with prior art. To get the patent approved, I had to make the claims so specific that, literally, moving the like button from the top left header of an info screen would not infringe the patent. There’s little question that any React patent will suffer from similar scope limitations. I’ve gotten a lot of “well then let’s just all use [alternative framework here].” Hold on a second. If Facebook patents cover React (diffing, componentization, etc), those patents likely cover Preact/Vue/et al. But React gives you a patent grant! With an alternative framework, you’re an infringer from day one. This all comes down to whether Facebook has patents and their desire to enforce them, but if you want to war game this to the nth degree, a React alternatives are more risky. And this war game continues to every nook. Take Facebook’s Relay. There’s little question that if any FB patents protect Relay, Apollo infringes. I use Apollo. Disclaimer: As with everything in law, I reserve the right to throw every word out like yesterday’s newspaper if presented with new information or a recent decision by a non-caffeinated judge. Hubris and the law make for bad bedfellows. If you have information or arguments that I didn’t consider, make them below! I will update this blog if any new information changes my opinion. And please don’t construe this post to conclude that all strong patent retaliations are ok. Some are not. My analysis might be quite different if the topic was x86 patent grants and licensees want to build x86 computers.